With the addition of our avionics tray, the Helm X650 mounts in the avionics stack of any aircraft. Its shallow depth means that it will install in aircraft like the old Cessna’s and Bonanza’s which are limited in depth behind the panel. 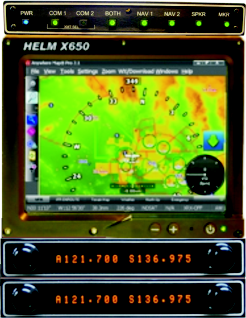 It turns the X650 into the perfect Panel Mount Aviation GPS/EFB. The ball studs attach to the back of the Helm X650 so that it simply snaps in and out of the Tray. This maintains the portable status of the X650. A log book entry by an A&P is all that is required for a certified aircraft like a Cessna 172. The X650 was designed to use the Ram Mount system of electronics mounts. There are no proprietary mounting system required. This is in keeping with the whole concept of the X650 as an open system. 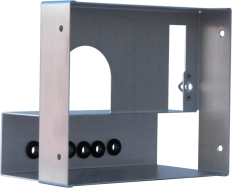 This is the standard yoke mount sold by Ram Mounts and holds the X650 securely. The X650 can be configured for landscape or portrait mode with a simple setting on the graphics menu. Even in landscape mode it will fit between the Rams Horn yoke of a Cessna 172 or 150. As the X650 was designed to run on 12-24 volts directly from the aircraft power, it comes with a 12 power cord standard. However, if you would like to adjust settings and work with the unit at home, this power adapter is available. Put USB connectors anywhere you want on your panel. Makes it easy to plug in USB devices. You can even wire them all the way back in the baggage area. Or put a USB port in your glove box. Place things like the XM Weather receiver, DVD drive, or external Storage were they will not be in the way. The possible locations are limitless. Want a great new avionics stack, complete with new state of the art Radios and Audio panel? We are putting together a great combo deal with the X650 and the new Valcom 2000 radio, and the AP 100 Audio panel. These are the slimmest Radios on the market. When combined with the X650 and AP 100 Audio pane, it makes great, compact, state of the art instillation.